Bottle Bank Band play 3 concerts at the end of September, in Hexham, Thropton and Wark. Each venue is very different but all will resound with the warm and vibrant sound of the four fiddles in the band’s trademark sound of rich and complex harmonies. The band recently performed to a sell-out audience at The Hearth Arts Centre, delighting the audience and making new fans with their mix of tunes from Tyneside, Northumberland … and some from further afield because they just love playing them! Bottle Bank Band brings together the talents of four Tyneside fiddlers: Sophy Ball, Chloe Jones, David Jones and Stewart Hardy. The band takes its name from the one-time residence of Tyneside’s most famous fiddling son, James Hill. 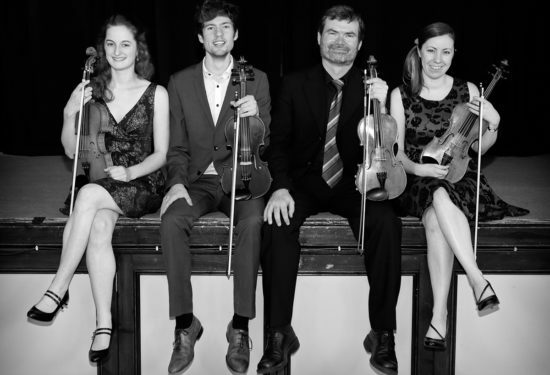 Their repertoire is firmly rooted in but by no means limited to the North East of England – a region which enjoys a centuries old tradition of fiddle playing. Individually the members of Bottle Bank Band have all established reputations as outstanding musicians. By coming together in this combination, they create an exciting and exhilarating musical landscape: the glorious sound of four fiddles, rich in harmony and captivating arrangements, is underpinned by an instinctive understanding of traditional playing, which gives voice and space to the musicality and talent of the individual players. Doors open 7pm for each concert.